It has been quite a rainy weekend here and our temperatures did go down so you’d think that would be great but it’s been so humid that I don’t think I feel that much of a difference. 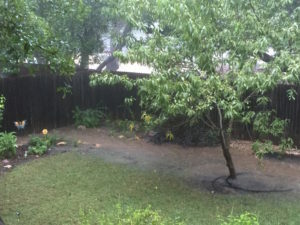 You can see the small river we had in our backyard! I meant to go check out a new bookstore but decided to put that off until another day. I realized that this is the last weekend before university classes start and I just know the area where the bookstore is located in would be swamped with tourists and I would rather go when it might not be as crowded. We still went to a bookstore but just our usual Barnes & Noble. I checked a few magazines, had my cafe mocha and left just as it started raining again. Now I’ve spent the afternoon adding some books to my library wish list and holds so hopefully next weekend I’ll have some books ready for check out. Other than that we’ve been enjoying Season 4 of Spiral. Have you watched this show? I really enjoy it. I guess just like with my mystery books that I love set in foreign location, same is true for my crime shows. Some of my favorite shows have been set in Sweden, France and Denmark. I have started receiving the Nordic Noir newsletter and we’ve taken note of a lot of shows we want to watch. Speaking of mysteries, stay tuned this week because I have a Q&A with the author of a new series and there’ll also be a giveaway. Yay! So hope you have a great start of the week. Now I’m going to grab a couple of the cowboy cookies my husband made the other day and we are going to continue watching Spiral. Glad you got some rain, but wow! A river in your backyard?! I heard there was some bad flooding in the San Antonio area. Hope it starts to cool down soon for you. We’ve been up and down in temps this past week. Saturday actually felt like fall and I wore a sweatshirt when we sat out on the deck enjoying our morning coffee. Yesterday it was hot as blazes. Fickle weather! We finally got some much needed rain after a very dry summer. Now it is back to hot and humid! It sounds like you’ve had an enjoyable weekend, albeit a wet and humid one. I haven’t seen Spiral, but I will definitely check it out. There seems to be a lot of rains lately in most places, including here where I live and though it’s a nice change to hot weathers, humidity remains. Urgh!